The design philosophy with plain bearings is that, should failure occur, the shaft or thrust collar should be unharmed with any damage limited to the bearing only. This imposes little restriction on the choice of the shaft or thrust collar, which is normally of steel. As a general rule the shaft should have a hardness of at least three times that of the bearing material. This means that mild steel is perfectly satisfactory with white metal bearings, though hardened steels are required for harder bearing alloys, such as the lead-bronzes. Also, nitrided shaft journals must be cleaned by lapping before use, if not, they are liable to cause bearing damage. 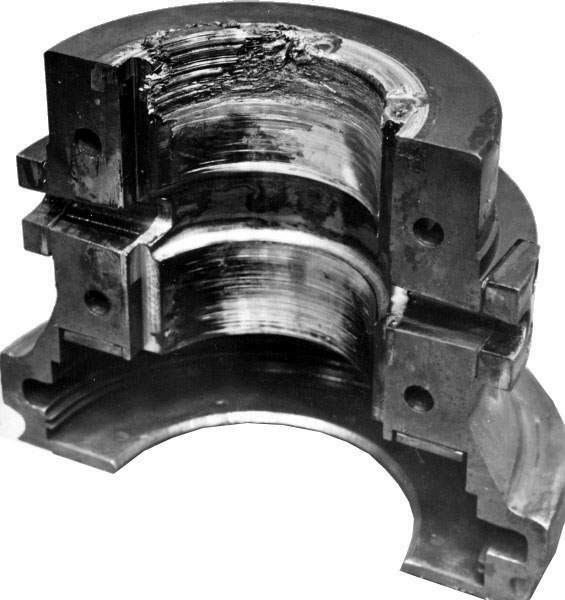 This failure occurs when a small particle of hard dirt or debris gets embedded in the bearing material, but continues to rub against the steel counter face. 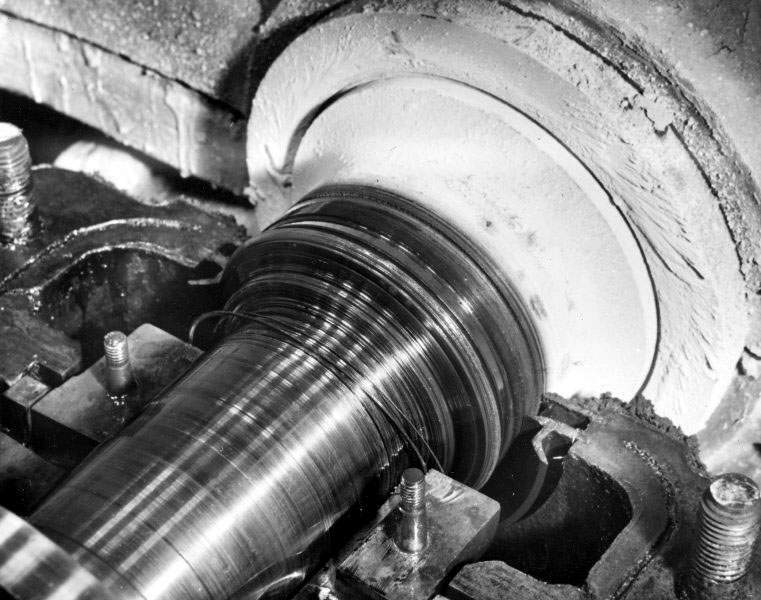 At high speed the temperature generated by the frictional rub carburizes the chromium in the steel in the presence of a hydrocarbon oil, producing hard chromium carbides that embed in the soft bearing material and act as cutting tools on the journal or thrust collar. The process continues by accretion of the embedded carbides and may result in a journal being turned completely through. Years ago a turboexpander manufacturer was running into intermittent bearing failures on their internal stainless steel rotating components. It would seem that their shaft journals, made from 17-4 PH stainless steel were susceptible to a phenomena called “wire wooling”. For reasons that are not fully understood, shaft materials like theirs, with a higher amount of chrome in them, are more susceptible to this phenomenon. 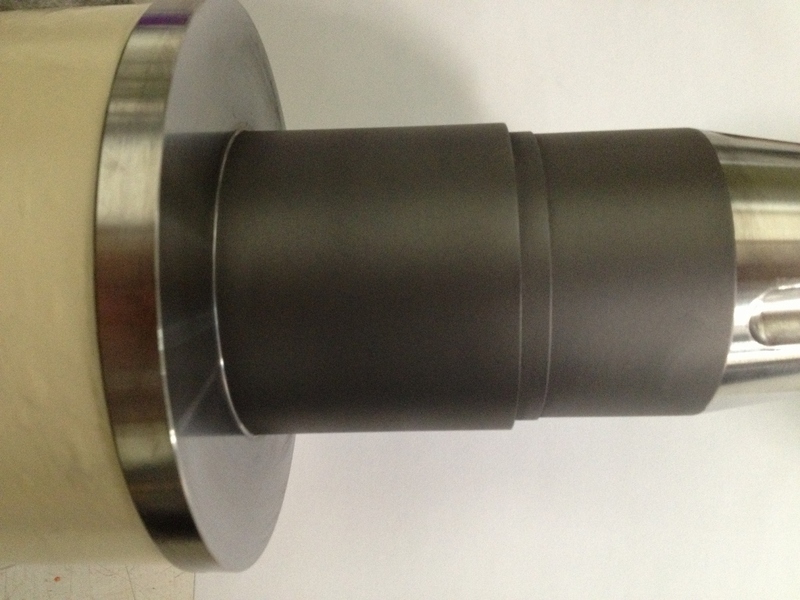 The recognized solution was to alter the surface of the shaft journal by nitriding or hardfacing with hard chrome. This entailed under sizing the shaft journals, sending it out to have it built back up again with chrome or a nitride process. This was more costly, significantly more difficult and had schedule and environmental impacts. Their team spent many months analyzing these solutions which proved to be challenging especially for their tight tolerances. They opted to try an alternate coating process, AMS 2525 where the hardened stainless steel shaft surface is subjected to a high velocity graphite impingement process. Simply meaning, graphite material is shot at high velocity into the shaft substrate where it gets impinged. The graphite sticks into the substrate, like a little forest graphite shards. Additionally the physical properties of graphite would let it impinge on itself, so it comes to a saturation point of impingement, with a maximum coating thickness of less than .0001”. This process cost less, is faster to process and is less work for the testing and assembly side. They also started using AMS2525 for non-bearing parts where the improved lubricity aided the movement of the surfaces without changing the part dimensions. The Engineering department has the ultimate responsibility for cost effective, environmentally sound solutions, that work. Switching from the thin dense hard chrome solution to the AMS2525 Graphite Impingement coating is an eloquent solution. The pictures and some bearing facts above are courtesy of Neale Consulting Engineers website. © Copyright 2013 AMS Coatings. All rights reserved.